In 1974, peasants digging a well near the city of Xian, in Shaanxi province, China, stumbled upon a cache of life-size, terracotta figures of soldiers at what was later determined to be the burial complex of the first emperor of the Qin Dynasty, Qin Shi Huang (259 B.C.-210 B.C.). 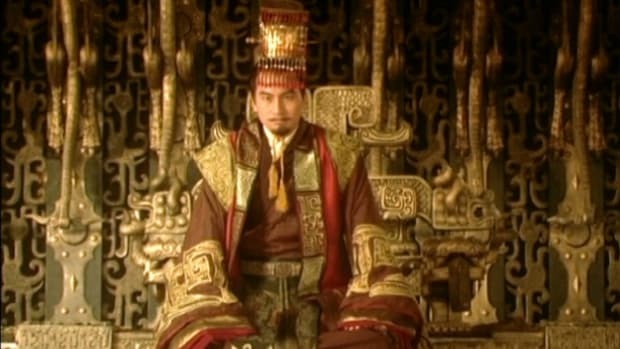 The emperor, who ruled China from 221 B.C. 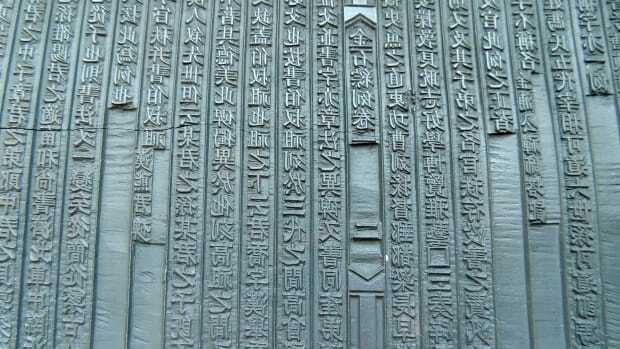 to 207 B.C., was credited with a series of public works projects, including an early iteration of the Great Wall, a standardized written language, a system of laws and a system of weights. An estimated 700,000 laborers worked to construct his burial complex at Xian as well as the approximately 8,000 army figures buried there to guard the emperor in the afterlife. 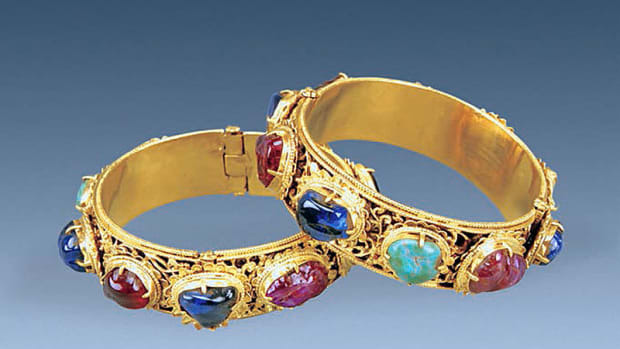 Since the initial discovery of the tombs, archeologists have continued to unearth additional artifacts nearby that provide information about ancient China. 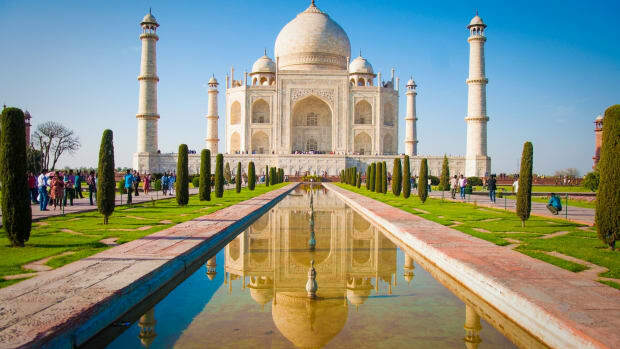 The site has also become a popular tourist attraction. 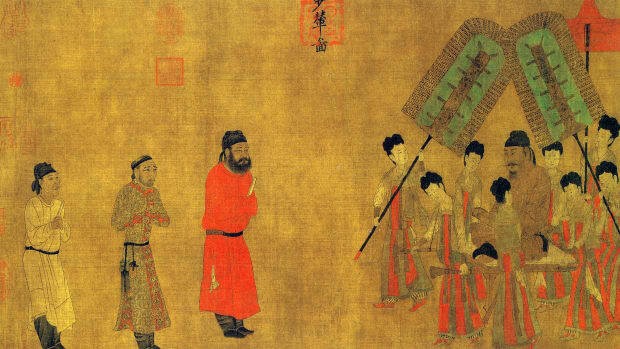 In 221 B.C., when Qin Shi Huang became emperor, China had just emerged from over 200 years of provincial conflict known as the Warring States Period. 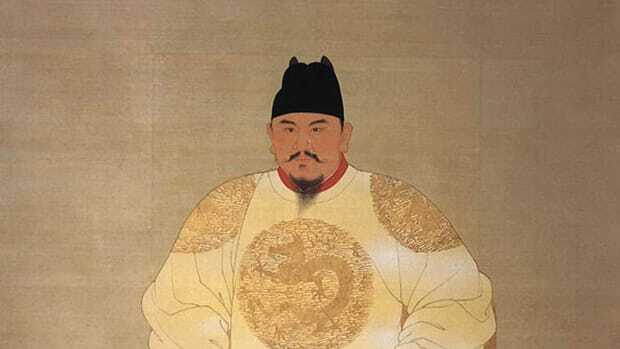 Huang is credited with unifying these provinces under one centralized government and establishing the capital at Xianyang. 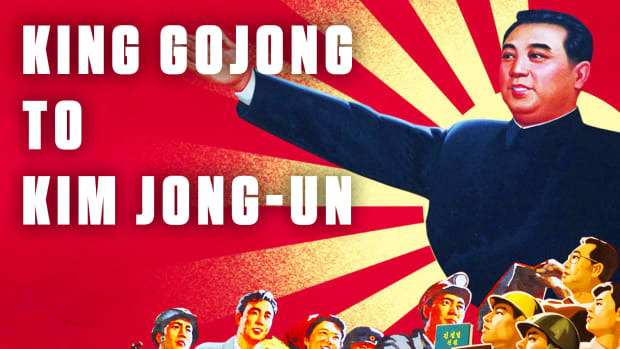 With centralization came the power to direct a huge work force able to accomplish remarkable building projects, including several palaces, a huge park for hunting and other outdoor recreation, and an early version of the Great Wall of China, a massive wall constructed to protect China’s northern borders. 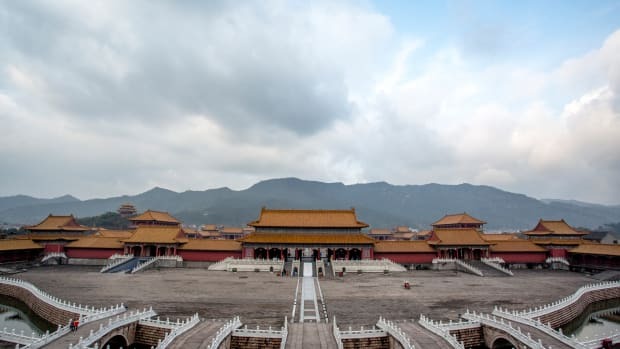 Another major project was the emperor’s elaborate burial complex, which was erected during his lifetime and reportedly took an estimated 700,000 workers some three decades to complete. Did you know? The thousands of terracotta warriors discovered at the Xian burial compound have distinctive individualized features, but most of their hands are identical and only eight molds were used to shape their heads. In March 1974, peasants working in a field approximately 20 miles east of Xian stumbled upon a burial site. 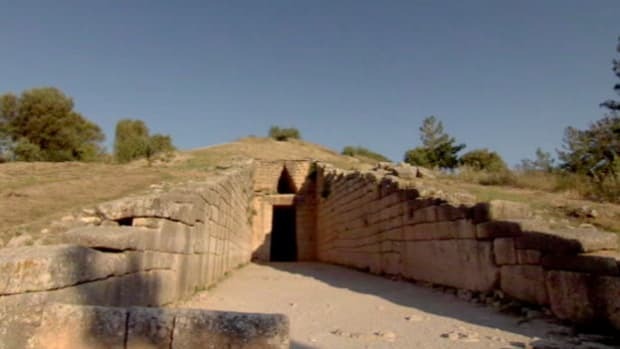 Soon identified as the tomb complex of the first emperor, this find was trumpeted as one of the most important archeological discoveries of the 20th century. Excavation of the area began almost immediately. By 1975, preliminary digs and surveys estimated the site to encompass some 20 square miles. In addition to a pyramid mound marking the emperor’s tomb, remains of a palace, offices, store houses, stables complete with horses’ bones and real straw and sacrificial altars and cemeteries for workers who were killed–presumably to protect grave treasures from robbers–have all been identified. Four pits were unearthed, three of which contained thousands of life-size figures, most in fragments; the fourth pit was empty, suggesting the burial site was left unfinished. 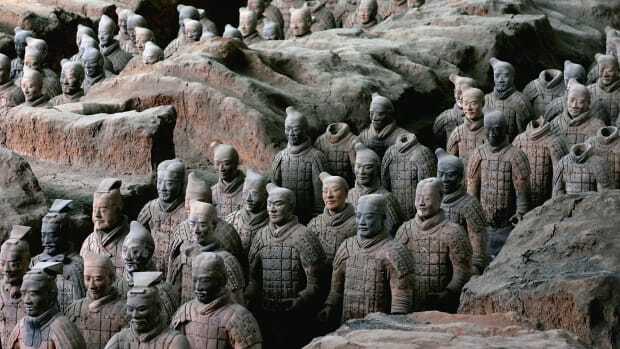 Researchers discovered the approximately 8,000 terracotta soldiers had been arranged in battle formation, and no two figures looked exactly the same. In addition to the soldiers, clay horses, bronze chariots, weapons and other artifacts were unearthed at the site. The arduous work of uncovering, protecting and restoring such remarkable artifacts continued into the early 21st century. Researchers discovered the complex had been robbed, probably sometime soon after the emperor’s death, and many of the terracotta figures were vandalized. It is possible, however, that the emperor’s own tomb was not violated. Restorers set about putting the figures back together again, building bodies, replacing heads, fixing painted surfaces and assembling numerous chariots and several hundred horses and their grooms. Researchers have been working at the burial complex since the 1970s; however, the emperor’s burial chamber has remained unopened. 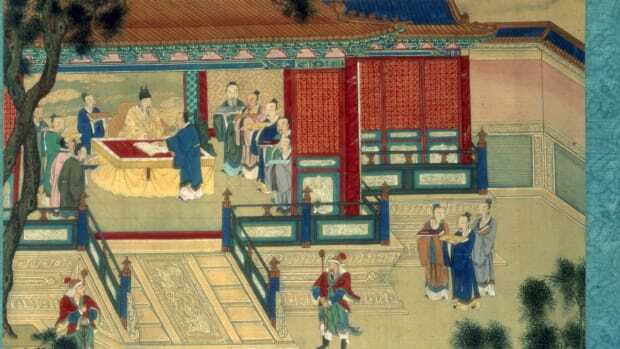 Fears of damaging the artifacts and emperor’s corpse–as happened in earlier botched archeological work in China–are compounded by concerns that opening the chamber may be dangerous. In a first century B.C. account titled “The Grand Scribe’s Records,” the grave and its contents are described. The author claims that the chamber was decorated to replicate the world, with precious stones in the ceiling to mark heavenly bodies and mercury streams in the floor to map local rivers. Modern surveys have proven that the ground around the burial chamber has dangerously high mercury content. Therefore, debate continues about whether to excavate in this area of the necropolis and what method might be used to both protect the grave contents and the people undertaking the work. 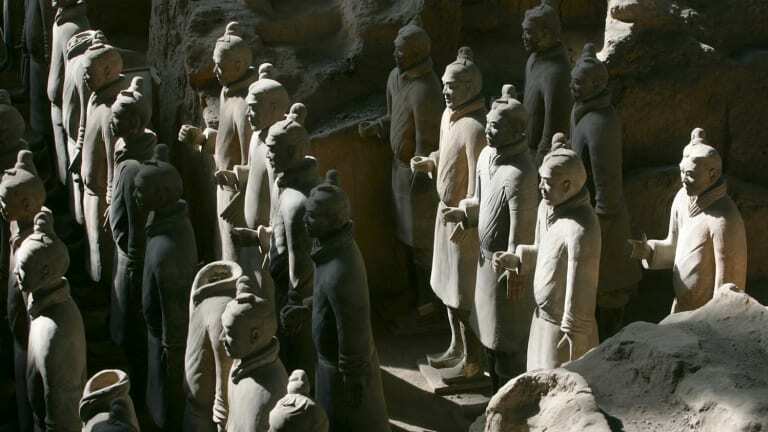 The discovery of the burial complex and its terracotta army brought worldwide attention to the city of Xian, along with the need to prepare for visitors. By the late 1970s, part of the site was opened for tourists. Museums were built nearby to display artifacts, and as tourism increased, the city of Xian opened more hotels, restaurants and gift shops. Soon the area was one of the premier tourist attractions in China, with tour groups arriving daily. 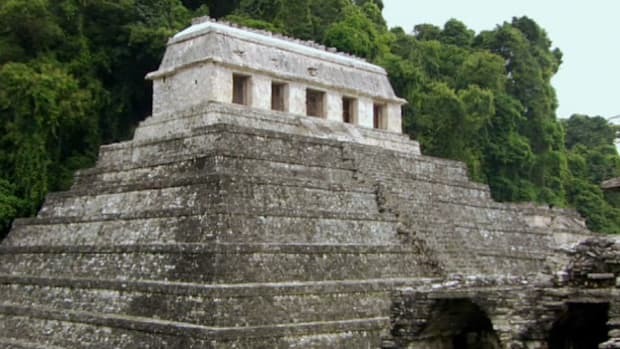 In 1987, the tomb complex was named a UNESCO World Cultural Heritage Site.